This evening, LG announced the first official accessory for their next flagship, G3, which will be announced next Tuesday. 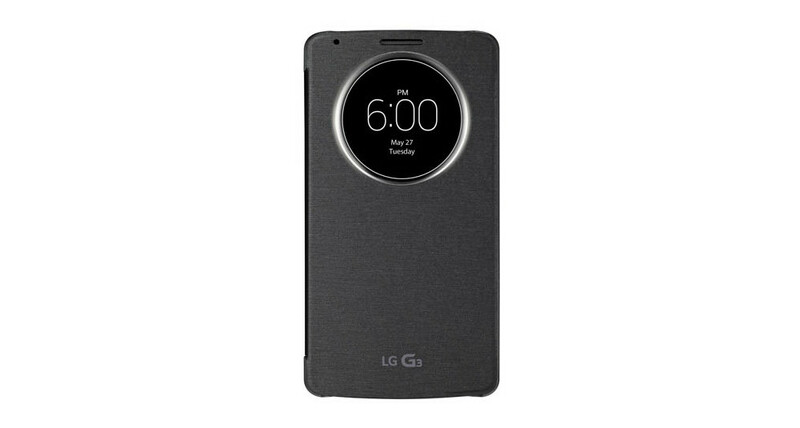 The accessory is called the QuickCircle Case, and is a form of protection that “does more than just protect,” it makes the G3 “infinitely more useful.” As LG mentioned in their brief press release for the product, this isn’t just a typical folder-style case. With its massive circular window, owners of the G3 will be able to use their phone without ever having to open the cover. The window allows you to do things like check the time, place calls, send text messages, take photos, listen to music, or get an update on health activity. It comes in five “eye-catching colors” that include black, white, gold, aqua, and pink. The case is designed to both protect and provide “grip-ability” while maintaining the device’s “sleek” lines. The case is also compatible with the phone’s Qi wireless charging. No pricing was given.